G. SKILL International Co. Ltd. is a leading high-performance memory manufacturer and designer. They specialize in high-performance SSD and memory product which are designed for PC gamers around the world. On the 20th February, the company announced that the Ripjaws SO-DIMM 1.35V high-performance DDR3 memory series for PCs and laptops clocked at 2600 MHz on the latest M8 system by barebone. As the technological world continues to evolve, so are high-end desktops. These desktops are slowly evolving into small form factor. Everything is becoming compact and more portable than ever. G. SKILL International Co. Ltd. wasted no time in adapting to the current trend. They successfully shifted the focus of their topnotch overclocking legacy from desktop to SO-DIMM memory. 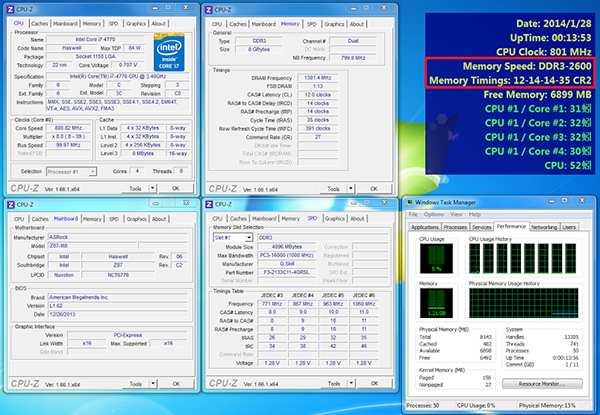 They were able to overclock Ripjaws 2133 MHz C11 1.35V memory to a mind boggling 2600 MHz. This particular memory kit runs with 8GB (4 GB x 2). This procedure was successful under dual-channel operation on ASRock M8.